Pinedale is a beautiful place to live ó if you don't mind being in sight of the highest-priority Superfund site on the Navajo Nation. You get used to it, said Pinedale native Don Frank. "My dad and two uncles worked there (at the Northeast Church Rock Mine)," Frank said. "Pretty much everybody worked there at one time." That includes Chapter President Willie Norton, one of Frank's uncles. "Dark and wet," he said when asked to describe life 1,900 feet below the ground. "Scary." Not as scary as it probably should have been. Norton, who started working in the mine in 1977, said no one told the miners or the maintenance guys like him that uranium was dangerous. History: According to oral history, this community along a tributary of the Rio Puerco was founded by a young woman of the Honágháanii Clan who escaped from the Long Walk and ran into another group of escapees in this area, one of whom she married. "People brought the rock up to build sheep corrals and horse corrals," he said. The result is that you won't find too many men over 60 in Pinedale Chapter. "Most of them passed on before they could get compensated (under the Radiation Exposure Compensation Act)," Norton said. "Their families aren't pursuing it." Norton's been lucky; as a maintenance specialist, he worked in the best-ventilated parts of the mine, where the water pumps were located. "I've never been sick a day in my life," he boasted, "other than hangovers." In 2011, the U.S. Environmental Protection Agency announced plans to clean up the 125-acre mine site, which will involve moving 1.4 million tons of contaminated soil into a capped pit. Looking over the fence at the mine site, nothing appears to be happening yet. "They filled in the shafts," said Frank, "and moved some of the buildings. Other than that, it looks pretty much like it has" since it closed in 1982. With the Rio Puerco (or "the Perky," as they call it here) snaking through this high valley on the Continental Divide, and many people living along it, Pinedale suffered perhaps as much as neighboring Churchrock Chapter when a holding pond at United Nuclear Corporation's Church Rock mill burst its dam, sending 93 million gallon of radioactive water down the Puerco. "We had to kill all our sheep, cattle and horses," Frank recalled. 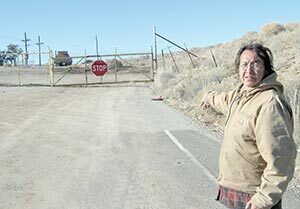 Most of Pinedale's wells are still not fit for human consumption; Norton said residents who aren't on NTUA water commute as far as Gallup, 20 minutes away, to fill their tanks. But even more than its nuclear legacy, Pinedale is hamstrung by its checkerboarded land pattern. You'll find here an intricate patchwork of trust land, executive order land, allotments and private parcels. It leads to things like Norton himself experienced.